Proper Running Form - You CAN Go the Distance! What is the proper running form? The subject of proper running form is, surprisingly, not a subject that a lot of runners talk about. Most of the runners I have asked say they have never really thought about, nor have they been coached in, the proper way to run. I have coached many people, including kids on cross-country teams, and I have run a lot of races and seen a lot of different running forms in my life. I have also talked to a bunch of former-runners who gave up running because it hurt or never felt comfortable or because they developed knee/hip problems. Many running related injuries and most of the dissatisfaction with running can be attributed to bad running form. Where and how your feet land is the most important part of your running form. Look at the picture above. This guy looks like he is moving along pretty well. It looks like many running strides you have seen before, right? What is wrong with his form? His problem is his leg is extended way out in front which will cause his foot to not only strike on the back of his heel, but well in front of his center of gravity. A lot of runners buy into the dangerous myth that a longer stride is better because you cover more ground with each step. That is absolutely not true! A shorter, faster stride is much more efficient and will dramatically reduce many common running injuries. Where your feet land is the most important part of running! First, it stops your forward momentum. Your body is jolted to a sudden stop and the weight of your body has to carry you through that jolt in order to roll into the next stride. We want to move forward smoothly without hindering the momentum. The second bad thing is also the most obvious: it hurts! Because you have just landed on your foot in front of your body, your heel, ankle, shin, knee, hip and lower back all absorb the shock of the landing. 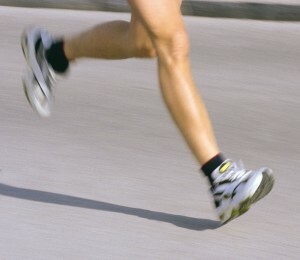 This can cause all kinds of injuries and the pain of every stride is often what causes people to stop running. One of the most common and painful running injuries is shin splints. Shin splints are often caused by landing on your heel in front of your body. As soon as your heel strikes the ground, your shin muscle is jerked violently as it tries to keep your foot from just flopping forward. Many people are able to avoid shin splints simply by adjusting their stride so they land more on the ball of their foot instead of on the heel. I am not a big fan of barefoot or minimalist running. I am not opposed to it, either. It just isn’t my thing right now. However, I think there is a lot we can learn about proper running form by running barefoot! Do an experiment. Take off your shoes and jog down your street for a few hundred yards and then jog back. How did it feel? If you actually did it, I bet you immediately changed your running style to avoid landing directly on your heel, didn’t you? Landing on your heel with your leg extended beyond your hips hurts a lot if you are barefoot, but not so much if you are wearing nice, highly cushioned running shoes. Remember when we were kids and we ran all over the neighborhood barefoot and never thought anything about it? I think we can learn much from watching our kids or other barefoot runners. They naturally adapt to a running form that minimizes the pain of impact. They naturally adopt a proper running form. The best running form is to have your foot land directly under your hips, directly at your center of gravity. The goal of each stride is to land and then immediately push off to move your body forward. If your stride is too far forward, you temporarily stop your forward motion and feel the painful jolt. If you land too far behind your center of gravity, you feel like you are stumbling forward and do not have an efficient push with each stride. Start off by simply jogging in place for 15 seconds. Jogging in place naturally maintains your center of gravity. Start moving forward by just leaning your upper body forward a bit. As you start to move, be aware of your center of gravity. As you start running faster, pay attention to where your feet are landing. They should land directly under your hips. Try running barefoot. Take off your shoes and run slowly for a few minutes. You can even run through your yard or a field. Many people like to start barefoot running on a track. Barefoot running will show you in a dramatic way just how dependent you have become on the padding in your shoes and how that dependency has caused you to develop a bad running form. This will automatically bring you back to the natural running style you were created to have. When you put your shoes back on, always be thinking about your stride and ask yourself “how would this feel right now if I were barefoot” and adjust your stride accordingly. Everyone is different and everyone will have a slightly different style of running. That’s OK. If I have gotten you to at least think about your running form and to try the experiments I have suggested, then I have accomplished something important. If you have struggled with shin splints or some other nagging knee or hip pain that has not been diagnosed by a doctor as some other condition, at least consider that it could be the result of way you are running. Try to make these changes and see if it helps. 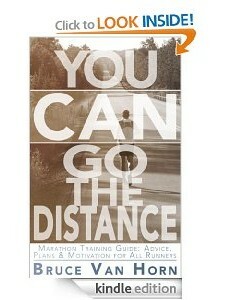 I know for myself that my running has improved and become much more comfortable as I have adapted my stride. I’ve been reading a little about barefoot running style and it does seem to make sense to me. My feet were always happiest unshod when I was a child, summer school holidays were spent mostly barefoot and as an adult I have always shied away from the typical woman’s show preferring sandals and trail shoes. I am new to running and so far 20mins running without stopping is my personal best so I am in awe of people who can run further than I would think of walking.